This document provides information on the BEMâ€™s fitted to XH series I & 2 vehicles. This is a supplement to the â€˜Adding a Trip computer to the EF/EL Falconâ€™ document http://www.fordmods.com/forums/documents.php?doc=26 or http://www.fordmods.com/forums/documents.php?doc=47, which should be read first, and be used in conjunction with this document. All XH series vehicles run an EF Falcon BEM. 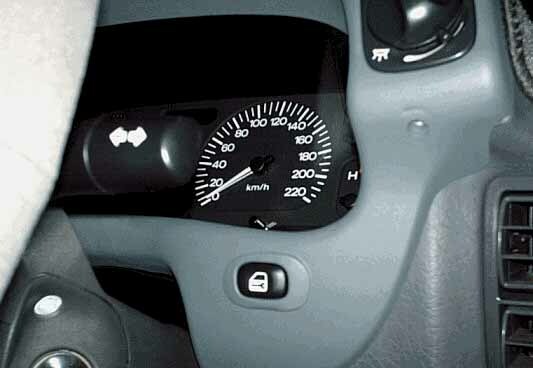 It is located above the accelerator pedal behind the dash. It is mounted by a metal bracket (that encases the BEM) with two bolts, see Fig 1. below. GLI/Outback models run a low series BEM, while the â€˜Sâ€™ and XR models run a mid series BEM, the mid series BEM has a â€˜Glacierâ€™ coloured case. Fig 1. EF High series (left) and XH mid series BEMs. With reference to the associated documents above â€“ listed below are the differences as per the XH series. Central locking: XH series I vehicles (except â€˜Sâ€™ and XR models) do not have central locking fitted. 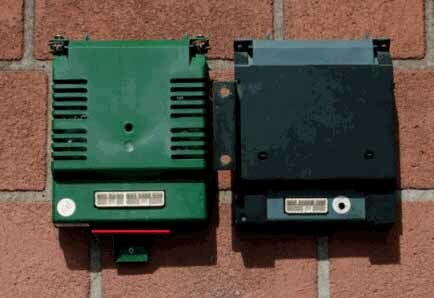 E series actuators can be fitted to the doors and wired in â€“ 4 wires per door are required, unlock (red/yellow â€“ upper connector pin 4), lock (yellow/black â€“ upper connector pin 6), earth, battery power (door lock fuse in fusebox â€“ add fuse and connector). A smartlock keyfob can be used for keyless operation â€“ locate the top right hand pin in the diagnosis connector - use the next pin one position to the left of it. In the keyfob learning procedure, instead of pressing the demist button (which is absent), earth the selected diagnosis connector pin. If the pin is absent, you can install one, and connect it to pin A2 of the lower BEM connector. Aftermarket actuators could also be fitted. A central locking switch can also be added, as per the E series vehicles, by connecting lower BEM connector pin A1, and upper BEM connector pin 8 to the locking switch â€“ see Fig 3. Hardtop tray release: If the tonneau cover has been replaced by a hardtop, an E series solenoid boot release could possibly be fitted and modified to operate. The solenoid coil needs to be earthed, also a line run to it from BEM upper connector pin 12, also a line from BEM upper connector pin 19, through a boot release switch with a line running to the solenoid coil. The release can then be operated by the boot release switch and/or a sedan smartlock keyfob using the boot button. This is theory only, and would need to be investigated further before carrying out the mod. Rear Demister: On models without this facility (other than â€˜Sâ€™ & XR models), it can be added, the cheapest option for the heating element would be an aftermarket one. 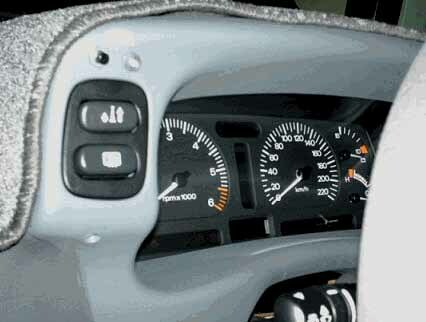 An EF/EL switch and plug is used â€“ the switch fits into the top left of the instrument cluster surround, the blank bezel will need a hole cut. The BEM connections needed are upper connector pin 18 (mid/low series) to the relay and lower connector pin A2 (mid/low series) to the switch. The demister relay is normally housed under the lower dash cover above the handbrake handle. A circuit diagram should be viewed to ascertain the remaining connections, including lighting. The extra features are already covered in the associated documents, so wonâ€™t be covered here, although advice is provided in the installation of the various components needed. The bracket from the existing BEM can be removed by drilling the 2 mounting rivets, the lower mount of the green BEM will need to be cut off, see Fig 1. (red line). The bracket can then be riveted or bolted onto the green BEM casing. 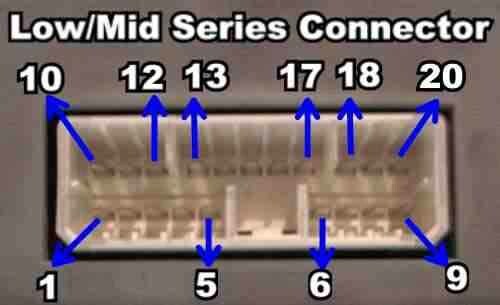 BEM wiring: The existing wiring does require to be moved to different pinout locations, due to the different lower connector used in the high series BEM. 1. Remove pin 18 (demist, â€˜Sâ€™ & XR only), relocate to high series lower connector B7 (cut off old pin and splice lower connector pin in). 2. Add pin 16, power antenna up (Yellow/Green). 3. Add pin 18, power antenna down (Red/White). * Indicates existing wiring fitted to â€˜Sâ€™ and XR models â€“ but can be fitted and wired up on other models as mentioned earlier in this document or as discussed in the associated documents. Fig 4. Power Antenna switch/demister switch install. Cluster independant illumination: Can be wired by adding high series lower connector pin A12 and splicing to the park lamps relay line (white/black) at the light switch plug. The lighting switch blue/red wire needs to be cut at the back of the lighting plug, and the remaining plug terminal wired to high series lower connector pin A2. The remaining blue/red wire needs a wire from high series lower connector pin B18 spliced into it. The lighting switch red/white wire needs to be cut at the back of the plug, and the remaining plug terminal wired to high series lower connector pin A7. The other end of the red/white wire can be taped off, as it wonâ€™t be used. The lighting switch white wire needs to be cut at the back of the plug, and taped off, high series lower connector pin B8 needs to spliced to the remaining white wire, the best point may be by splicing into the instrument cluster RH plug, pin 16, see http://www.fordmods.com/forums/documents.php?doc=14 - the dimming resistor will need to be removed from the instrument cluster, so refer to http://www.fordmods.com/forums/documents.php?doc=14 as well for this. Finally, the light switch will need to be modified. An E series Fairmont (Ghia/LTD/Fairlane, etc) light switch is required, as they are setup internally for the dimming function. They can be differentiated from the std switch by the green connector on the rear casing in lieu of the beige coloured one. As the XH has different orientation for the light switch and dimmer switch, the actuating/wiper arms need to be exchanged from the XH switch into the E series switch, the items needing replacement are pictured in Fig 4. Both switches need to be dismantled to enable this â€“ be careful as there are spring loaded ball bearings for switch movement. Fig 5. Light switch items that require modification. Q: I just want to upgrade from a low series to mid series BEM, how do I do that ? A: As per the EFâ€™s, remove the low series, plug in the mid series. You can swap the mounting bracket over as previously described, or remove the Phillips head screw holding the black base into the plastic casing, remove the base, and swap circuit boards over. 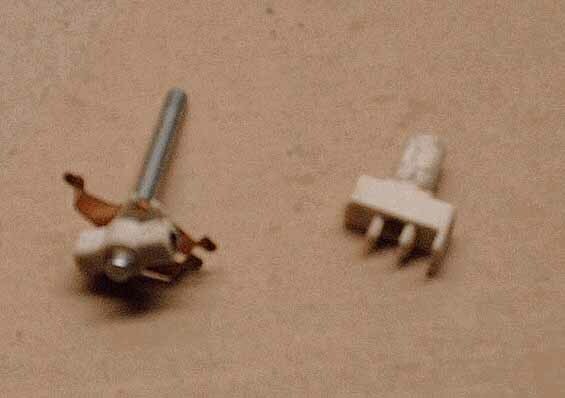 Q: How do I remove the pins from the various plugs ? A: Youâ€™ll find that there is a lever type insert in the side of the plug, you need to lift it with an instrument screwdriver or similar, then if you look down the front face of the plug, youâ€™ll notice that there are fingers holding each pin in place â€“ insert a small instrument screwdriver, lift the finger, and the pin can be pulled out from the rear. Document written by: snap0964 on 26 2007>, Copyright © 2007 snap0964, all rights reserved.